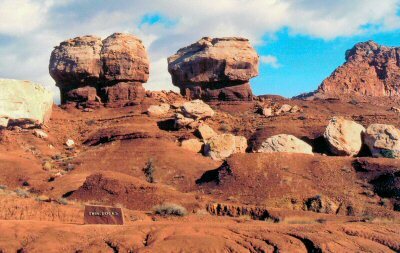 Utah pictures 2006(1), by Roger Bourke White Jr. In the fall of 2006 I took another swing through central and southern Utah, looking for neat pictures. Here are the fruits of that swing. This is taken near the center of Utah, at Capital Reef National Park. Southern Utah (all of Utah south of Utah Valley is called southern Utah) is famous for red sandstone cliffs, and this is a good example of what makes it famous. 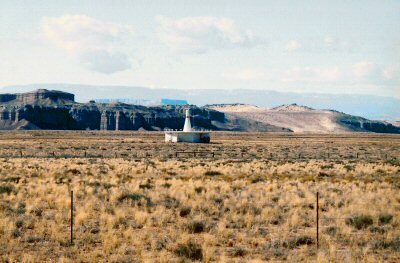 Utah's arid climate and clear air mean that some rocks and cliffs can be seen from miles and miles away. 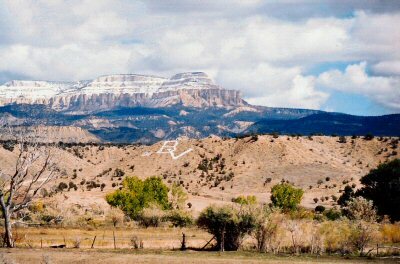 Local residents have taken advantage of this by putting school initials on various hillsides throughout Utah. This is one example. It's an annual school ritual to refresh these signs. They are a lot bigger than they look, so it will take most of the school most of a day to freshen up the paint. 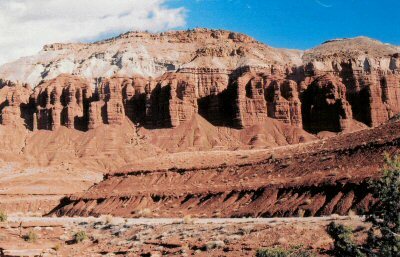 Another example of the red sandstone cliffs of southern Utah. California movie makers love these hills. 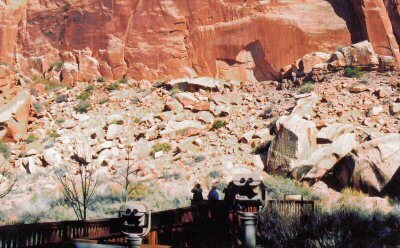 Most of southern Utah is too dry and too rocky to support many people. But between some of the hills and cliffs are valleys with rivers that flow year around. These valleys can support human life, and have been doing so since Native Americans first moved into Western North America. This is one example of such a valley. 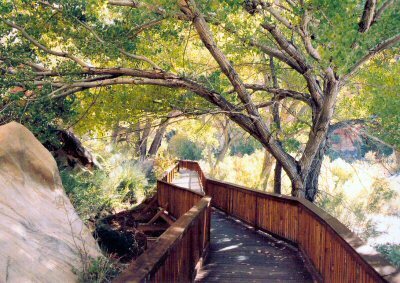 This shaded boardwalk is as refreshing as it looks.... But why is it here? The boardwalk leads to these telescopes pointing at this cliff.... But why look closely at red rocks? If you missed them in the earlier picture, there are Indian petroglyphs drawn on these rocks. 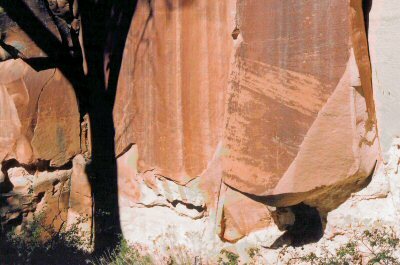 Petroglyphs are rock drawings. Some of these drawings are made by Indians who lived here long ago, and some by Mormon settlers who moved in to the valley about one hundred years ago. When the Mormons came there were no Indians living here. This area can support human life some times, but not all the time. If a years-long drought hits the area, the river dries up, and the people living here must move elsewhere. Sometimes a river-drying drought will last fifty years. After people move out of this region, it may take hundreds of years before someone thinks to come back. 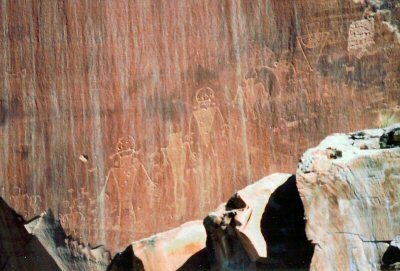 The Native American petroglyphs are an ancient mystery of southern Utah. This building is a modern mystery. What is it for? Hint: ask an airplane pilot. 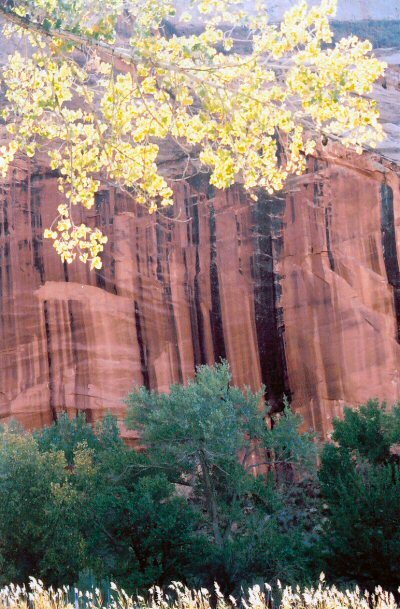 The pictures above are taken in the valleys of southern Utah. Now we will move up into the mountains surrounding the valleys. 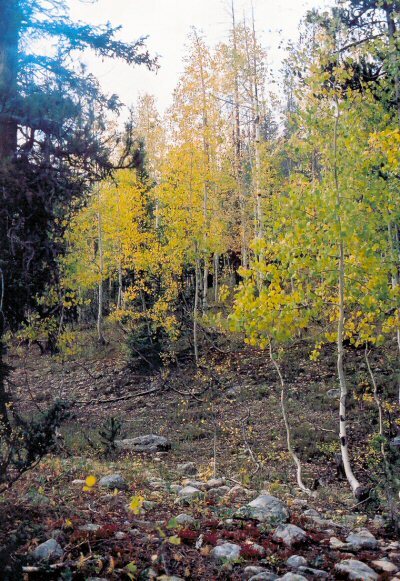 This is a picture of quaking aspen trees taken in October at about 3500 meters in elevation. Winter is about to come to this high land. 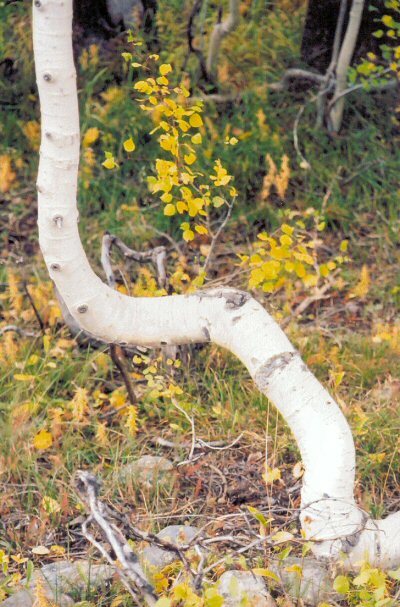 This aspen has been bent by avalanches... but it survives.